BLACK AND GOLD EVENING KAFTAN This is a unique kaftan designed specially for evenings and special occasions. It is elegant and smart. ..
EVENINGS-SPECIAL OCCASIONS KAFTAN - BLACK WITH GOLD ROSE OVERLAY This lovely free flowing kaftan is made with your comfort and beauty in mind. If you ever need to go to a special event and can’t find anything to wear, here is the garment for you. 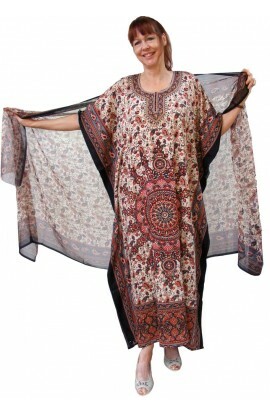 The fabric is a mid weight stretch..
T Rainfall Kaftan – evenings, special occasions The fabric of this kaftan is navy with a self coloured floral pattern. On top of this base pattern is a gold design that resembles heavy falling rain. This is a mid-weight polyester jersey fabric. When laid flat, the k.. 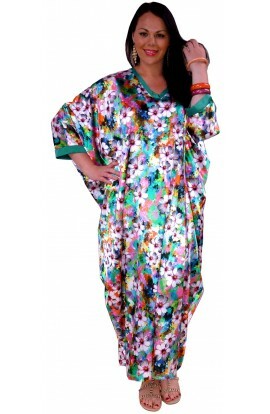 The Little Black Kaftan A brand new item from Kaftan Krazy UK Perfect for that special occasion. Perfect for that Evening Dinner at a special restaurant or on a Cruise. Great for the coming Christmas and New Year Season. If you buy it from our standard range, the size will be sui..